From 6th April 2017 the new insolvency rules come into effect, these changes will no doubt have significant impact on the Insolvency profession. The changes have been brought about to increase creditor engagement and to streamline the profession. Whether these changes will bring about the desired improvements is unknown but what we can be sure off they are due to start very soon. The changes represent the most significant shake up in the insolvency professional legislation for more than 30 years when the Insolvency Act was introduced in 1986. The new legislation aims to consolidate the existing rules and their amendments into a single piece of legislation. As well as modernising and simplifying the language used to make it easier to understand. Separate insolvency rules for Scotland will be introduced later in the year. The key aims of the legislators in introducing these changes were to increase creditor engagement in the insolvency process and to reduce unnecessary administrative tasks that in turn reduce the returns to creditors. There will be no fundamental changes to the individual insolvency procedures. Physical creditor meetings have been abolished as the means by which insolvency practitioners seek appointment on insolvency cases and, once appointed, obtain decisions from creditors on matters such as their remuneration, taking legal action, and extending administration periods. Physical meetings will only take place if creditors have actually requested them, instead creditors will be asked to make decisions by a variety of means including by correspondence, electronic voting and virtual meetings. Insolvency practitioners will also be able to seek confirmation of decisions made using the deemed consent procedure, whereby if no creditors object within a specified period, the decision is deemed to have been approved. All of these measures are designed to assist the insolvency practitioner in choosing the method which will suit the creditors best, making it easier for creditors to get involved and take part in the decision-making process. It is hoped that new technologies will be developed to assist insolvency practitioners in making these new decision procedures work in practice including forms of electronic communication. 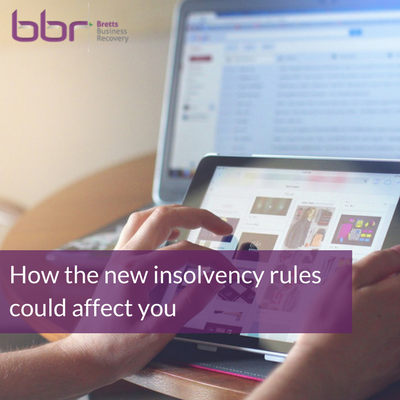 To bring the service in line with modern business, the new insolvency rules encourage the use of electronic communication between insolvency practitioners and creditors rather than traditional post. The use of email is a faster and more efficient means of communication. Also more web based solutions will be developed such as the use of an insolvency practitioner’s website as a means of making information more widely available to creditors. Creditors will be able to log on and see all of the reports and decisions sought on a case 24hours a day. Creditors who see no benefit of being actively involved in an insolvency process, for example, where there will be no dividend payment anticipated due to a lack of available assets, will be able to “opt out” of all correspondence and avoid having to read through unwanted progress reports or requests for decisions. Opting out will not, however, mean that they do not receive dividends if they become available. This should be welcomed by many creditors who often express frustration at receiving endless unwanted reports. While there are no real changes to procedures the change in communications and the removal of face to face meetings will undoubtedly streamline the process. Also the ability of an insolvency practitioner to accept small debts (those below £1,000) for distribution purposes without the creditor having to formally prove will be welcomed, but will be most beneficial in IVAs where consumer debts of low values are common. This should reduce the administrative burden for insolvency practitioners and creditors alike. It will take time for creditors, directors and insolvency practitioners to get used to the new decision making processes. With more upfront communication needed as creditors will need the new processes to be explained. There are substantial additional requirements under the new rules for insolvency practitioners to provide creditors with information on their new rights and obligations and this will increase the size of the initial letters received by creditors. How this is managed by individual insolvency practitioners will be key to the success in implementing the changes. Isobel Brett says, “whilst I welcome the consolidation to the existing rules and any simplification to encourage creditors participation as with any changes they will take time to get used to and to truly know whether the they have had the desired effect”. Puppet director disqualified for 12 years after she illegally transferred £2.5 million worth of property assets to her father-in-law. The Circle on Thursday 21st March…. Deal or no deal time to give your company a health check.